After eight years of post-conflict transition, political and social progress in Nepal has been slow. Approximately 25 percent of Nepal’s population lives below the national poverty line on less than USD 0.50 cents per day. More than 900,000 people are in need of food assistance. Frequent natural disasters negatively affect livelihoods and food security. Nepal’s vulnerability to high food prices, especially in remote mountain areas, exacerbates food insecurity. Challenging and isolated geography, natural disasters, civil unrest and lack of infrastructure complicate efforts to improve livelihoods, establish functioning markets and transport food. This was most evident during the 2015 twin earthquakes that took the lives of more than 9,000 people and left millions homeless. Almost one year after the devastating twin earthquakes of 2015, WFP continues to focus on the food security of vulnerable, earthquake-affected populations while making efforts to strengthen preparedness for future disasters. In early February, WFP completed its three-phase emergency operation serving earthquake-affected populations. The operation served more than 2 million people with food support, providing over 20,000 metric tons of food. WFP is now working with the Nepalese Government to tackle food insecurity, focusing on social safety nets in the areas of nutrition, education and rural livelihoods support. 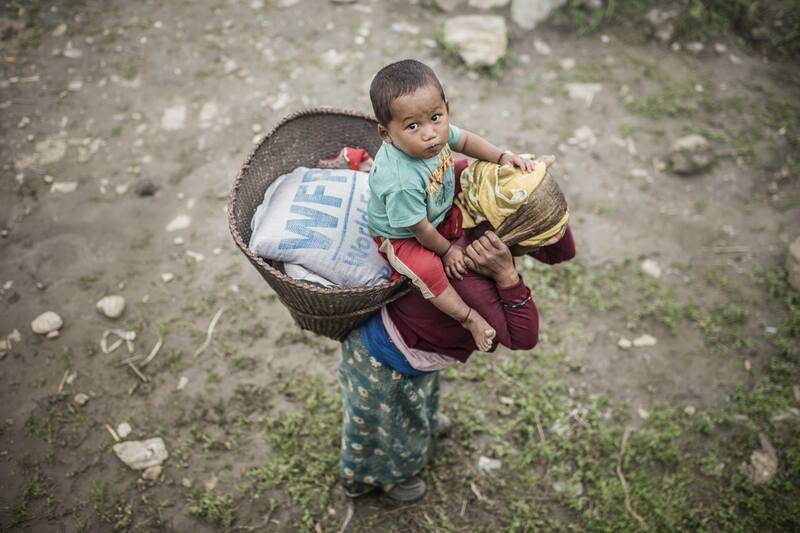 WFP also provides food assistance to refugees from Bhutan in Nepal. Livelihoods creation – WFP provides seasonal employment and livelihood training enabling the rehabilitation of rural roads, irrigation channels and other community assets. Education – WFP provides school meals as well as non-food items such as energy-saving stoves and school furniture. Nutrition – WFP assists the Ministry of Health in the prevention of chronic malnutrition among pregnant women, nursing mothers and children under the age of 5 months.